Take part in Shane Confectionery's buttercream egg decorating workshop. With spring officially sprung, it's time to start looking forward to Easter activities. The holiday is Sunday, April 21. 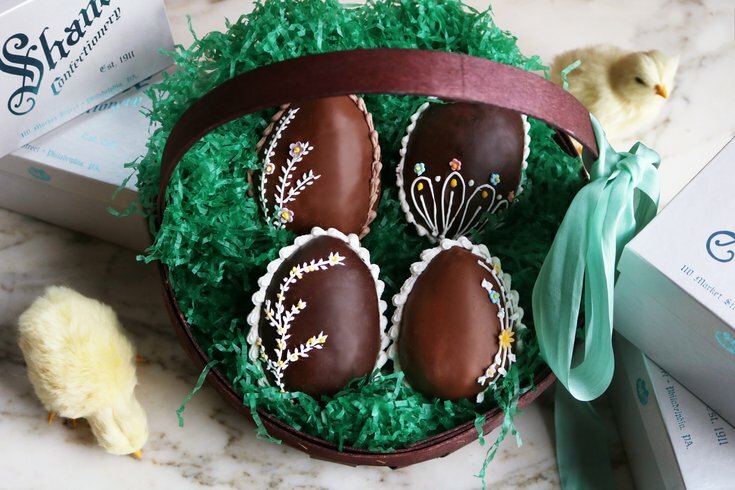 Prepare by upping your egg-decorating game at a workshop at historic candy shop Shane Confectionery in Old City. Attendees will learn tips and tricks for piping frosting to create flowers and designs on half-pound, chocolate-dipped, vanilla buttercream eggs. Shane Confectionery's oversized buttercream eggs (.5-pound, 1-pound, and 2-pound) are only available around Easter, so it's a special treat to get one. There will be a class at 6:30 p.m. on both Friday, April 5, and Saturday, April 6. Tickets are $28 and each attendee receives their own egg. "Families have been visiting Shane for generations for their buttercream eggs, each adorned with the name of the intended recipient. Shane opened its kitchen for egg decorating classes last year, and hope that this too will become a time-honored, family tradition," states a press release on the event.